I can already taste the Butterbeer. Last summer, my sister Katelyn won a radio station contest (her 2nd won radio station contest!!) for a trip to Universal Studios’ Wizarding World of Harry Potter and Islands of Adventure. It includes 3-day passes to both parks, plane fare, transportation to/from the airport and 3 nights/4 days at the Hard Rock Hotel in Orlando. It was for her and three guests. She graciously picked me, our youngest sister Christie, and her boyfriend Jeremiah #2. It’s going to be fun! I’m going to have my brand new awesome camera with me to take lots of pictures and some video for Facebook and blogging purposes. That’s pretty much the story. I packed twice last night and again this afternoon before I left, all in the name of trying to pack efficiently. 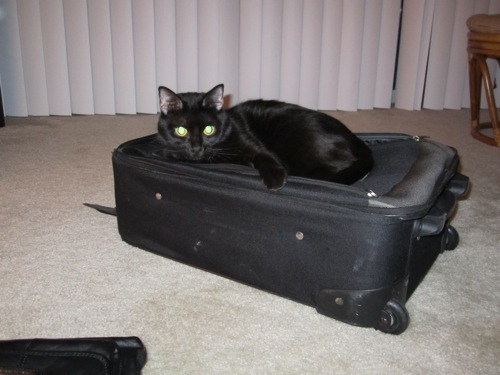 I still ended up with a full suitcase that leaves zero room for bringing back any souvenirs! We’re staying at the damn HARD ROCK for goodness sake! My dream hotel for Comic Con is the San Diego Hard Rock. I had to make sure I had enough “night time outfits” (aka not t-shirts & sneakers) just in case the Orlando Hard Rock was just as rockin’ as the San Diego one was. They have FANCY BATHROOMS! Just ask Ralph, he knows! 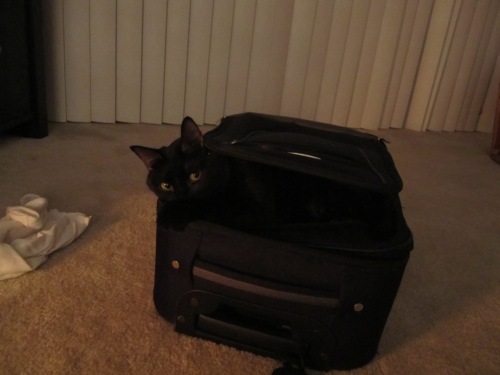 Yes, she is inside the top part of the suitcase in the last two pictures. At one point, she rolled over on her back like she was in a sleeping bag. It was so funny. 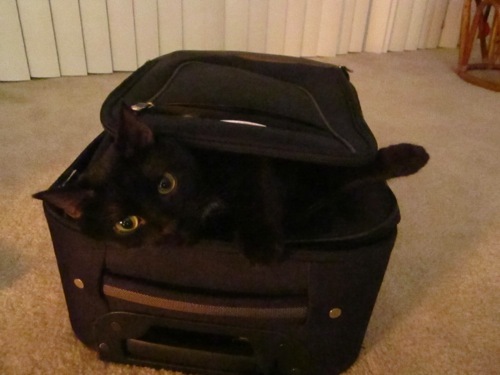 I left the suitcase out for her today to play in because I felt bad leaving again. I’m gonna miss Jay and Zoe 🙁 but I’m so fortunate that my sister has super awesome luck to counter my generally bad luck lol! Yay, watch out Hogwarts, here I come!! This entry was posted in Family, Harry Potter, Story time, Zoe and tagged Islands of Adventure, Southwest, Traveling, Universal Studios, Wizarding World of Harry Potter. Bookmark the permalink.